The United States Chess Federation (USCF) is currently celebrating its 75th anniversary during the U.S. Open Chess Tournament. America’s most prestigious open tournament is taking place at the Rosen Centre Hotel (9840 International Dr., Orlando FL 32819) in the vacation hub of Orlando, Florida, the home of the Disney franchise. 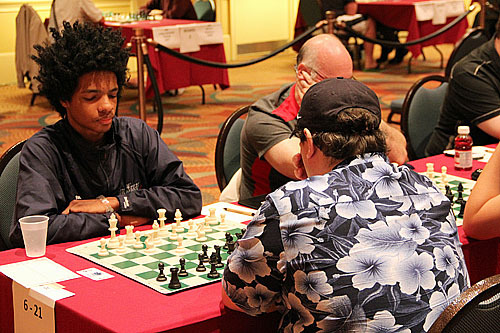 Months ago the United States Chess Federation announced a switch from St. Louis to Orlando given the closing of the Milliennium Hotel in St. Louis. The tournament is being held from July 26th-August 3rd in three formats: traditional, six-day and four-day. Scholastic players are out in full force! The tournament generally does not draw the strongest field, but usually will attract a lot of legendary figures who have made it a tradition to compete in America’s staple chess event. It is also the time when the business of the USCF is conducted. This festival also includes a number of other tournaments including the Denker High School Champions Tournaments, the K8 Barber tournament and the National Girls Invitational. There are also tournaments for Blitz, Bughouse and Mixed Doubles. This year the U.S. Open will have GM Illia Nyzhnyk of the Ukraine as the top seed along with GMs Giorgi Margvelashvili and Alexander Shabalov. Some of the legends taking part are GMs Ron Henley and James Tarjan. One of the most notable trends in American tournaments is the presence of scholastic players. Spanning the room of a tournament hall will give an idea of the youth movement of chess. While legendary stars dot the hall, tomorrow’s stars are being borne. PHOTOS BY THE CHESS DRUM! Looks like Funlearnin, is going on over there! wow, James Tarjan, i recall the name during my ULTRAMODERN Studies but cant remember where right now! haha Maybe gotta go through some of my Traditional notes!!! lol Daaim strikes again! Yes… I may ask him for an interview. I used to study his games. I’m fascinated by GM Tarjan, who was a GM who showed both great strength and greater potential, and who made the decision to quit Chess, seemingly in an abrupt way. Obviously, the career prospects as a Chess Professional weren’t great, but he seems to have gone 30+ years without having played in a serious tournament. Great to see him back. 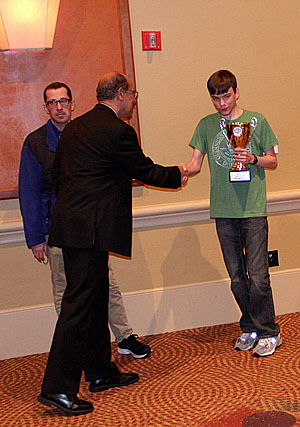 Joshua Colas played in the Denker Tournament of High School Champions, and was leading through 5 rounds, with 4.5/5. Unfortunately, he lost to Christopher Gu (whom he had just faced at the U.S. Cadet), and so finished with 4.5/6, good for =3rd Place. Still a good rebound from his performance at the Cadet. Gu won Clear 1st with 5.5/6. Aside from Colas and Gu, the Cadet Champion Edward Song was another player who played events back to back. He ceded a couple of draws, but finished in 2nd Place, with 5.0/6. With his performance, his rating now tops 2400. 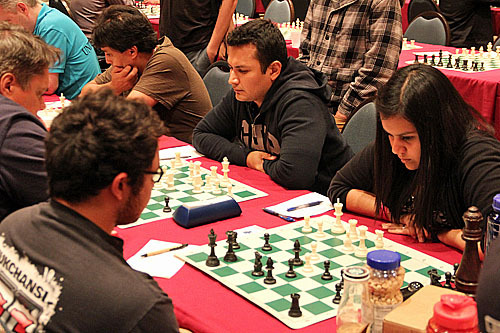 Claudia Munoz finished tied for 1st Place with 5.0/6, but this time did not win on Tie-Breaks. The winner was Jennifer R. Yu (Yu’s tiebreaks were superior, as she started off with 5 straight wins, only losing to Regam in the final round), and Jessica Regam was part of that tie. Tournament Top seed (and only Master) Annie Wang had a rough tournament, losing twice en route to a 3.5/6 score. In the Barber K-8 Championship, Advait Patel of West Virginia (not usually a font of young Chess talent) prevailed over 8 other Masters with an undefeated 5.0/6, good enough for Clear 1st in a hard-fought event. Here is a short interview I did with Josh. Interesting seeing a lot of these scholastic players here. About half of the tournament consists of scholastic players. Conrad “Lightning” Holt wins U.S. Open! GM Conrad Holt receiving the Edmondson Cup. Conrad Holt has had a great run in the last couple of years. The physics major and rising senior at University of Texas at Dallas made a sparkling debut in last year’s U.S. Championship scoring a creditable 5th place with a solid +2. He did not play in the championship this year, but will make a return in 2015 by virtue of his U.S. Open victory. 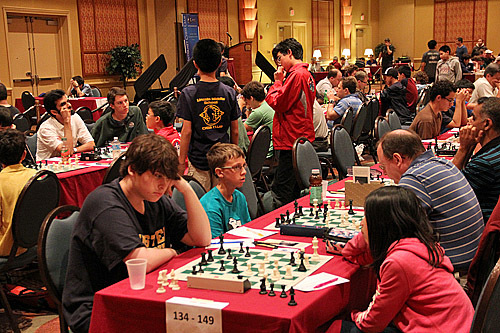 Nearly 400 players trekked across the U.S. to compete in the 75th anniversary of the USCF. The competition was stiff as Ukranian star Illia Nyzhnyk was the top seed followed by a mixture of youthful vigor and legendary pedigree. 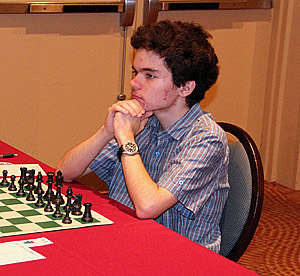 With a Grandmaster roster including Alexander Shabalov, Julio Becerra, Giorgi Margvelashvili and Fidel Corrales Jimenez, Holt was the unlikely candidate to emerge from the field. Legendary figures James Tarjan and Ron Henley were on hand to give the event historic legitimacy. Both were top American players in the 70s and 80s respectively. So the unheralded and soft-spoken player rose from the obscure “chess desert” of Wichita, Kansas won the event by beating IM Michael Mulyar in a “lightning” Armageddon match. Some of his friends have given him nicknames like “Thunder Holt”, but he would be “Lightning Holt” today as he beat Mulyar quite handily. 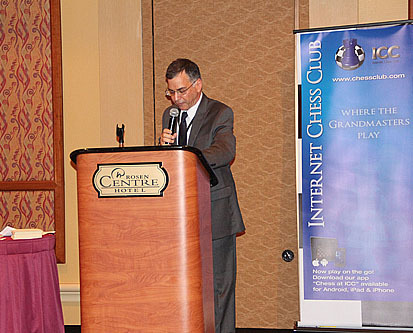 During the U.S. Open every year, there are committee reports and the general sessions to vote on various matters concerning the development of the chess infrastructure. Various USCF officials were present and President Ruth Haring played in the tournament! 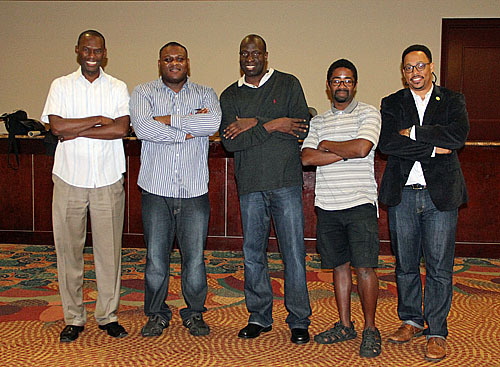 Other executives such as Tim Redman, Harold Winston were seen milling about. One of the most encouraging observations one could easily make is that scholastic chess is strong and steadily growing. This has become a “game of the youth” with approximately half of the players present seemingly fitting into this category. Also noted were the number of girls in the field as many stayed on after competing in the National Girls Championship. The first National Girls Closed Champion Claudia Munoz was competing as well. She shared a moment with The Chess Drum audience. Listen! 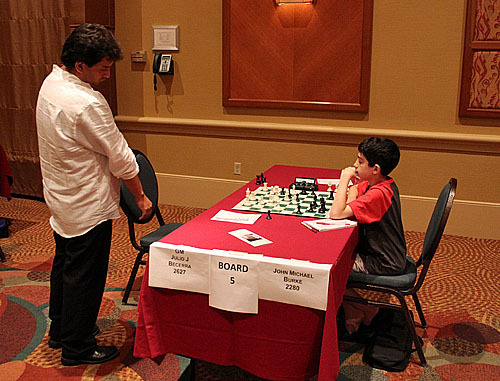 GM Julio Becerra (2627) awaits move of young star John Michael Burke (2280), 1/2-1/2! 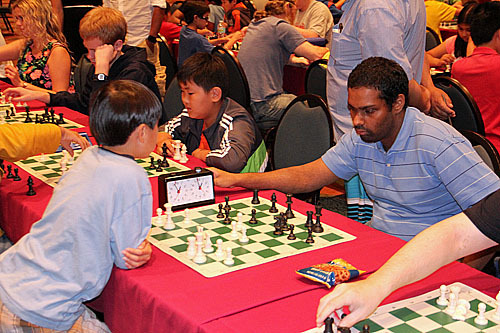 Chess has become “child’s play” as a good portion of the U.S. Open participants were scholastic players. Some players stood out more than others. Josh Alexander (2140) was one of them! He finished with 5/9. The site of Orlando was also an attraction given its proximity to a virtual playground of exciting leisure activities such as Disney, Universal Studios, Seaworld and dozens of other theme parks. 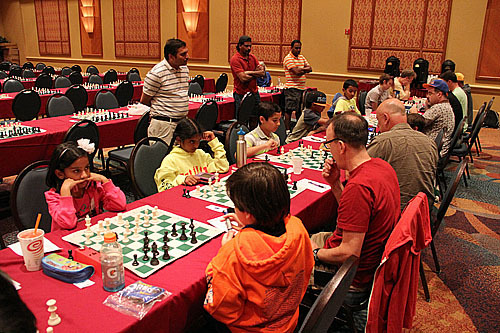 It is no surprise that many groups choose Orlando as their convention site and this year a diverse group shared the Rosen Centre Hotel with chess players. 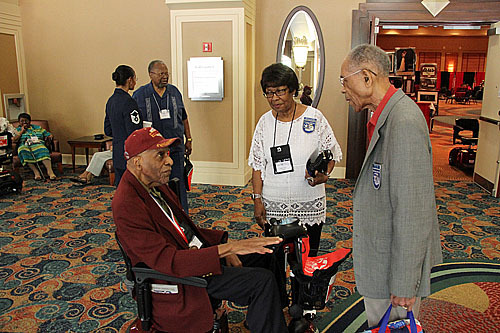 The Tuskegee Airman were have their annual conference giving honor to the pivotal role that African-Americans played in World War II combat missions. Harry Potter conferees… Jordan Falby and Ashley Yono. FM Kazim Gulamali facing a young aspirant in blitz tourney. 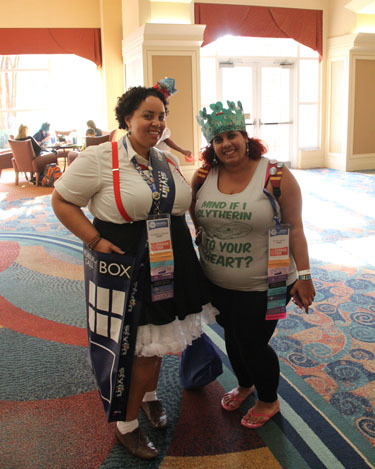 There was also “leakycon” conference of Harry Potter enthusiasts. This conference attracted young and old and were made known by their outlandish theme costumes and accessories. Then there was the Miss Teen beauty pageant where young girls were competing for national crown. The actual Miss America titlists from each state were there as well. The women were all striking in appearance… and very tall! Certainly if there was an example of beauty and the beast, this weekend provided many examples. All in all, a very enjoyable event. The Chief Director Jon Haskel ran a smooth tournament with most of the rounds starting on time and with the Monroi game system in full effect. The prime location may provide an idea that Orlando could be the site of a future Olympiad tournament. Claudia Munoz at the 2014 U.S. Open. Claudia Munoz is known in chess circles for her chess promotion activities in social networking. The 16-year old is the reigning National Girls champion and took part in the U.S. Open where we conducted a short interview. Enrolled in Texas Virtual Academy, an online school for those youth looking for a more flexible schedule. The charming daughter of Mexican nationals, she wears a 1000-watt smile and is quite enthusiastic in her chess pursuits. She recently stated that she wanted to be a role model for Hispanics. As a dual citizen she has competed in both U.S. and Mexican national events. A month ago she won the inaugural National Girls Closed Championship and with the trophy came a $10,000 scholarship to the University of New Hampshire. After the interview, The Chess Drum asked if she was going to opt for an online university program. She was undecided, but she was evaluate her options which includes scholarship opportunities at traditional universities. We look forward to her continued contributions. A very charming girl indeed! Follow Claudia on Facebook and Twitter!